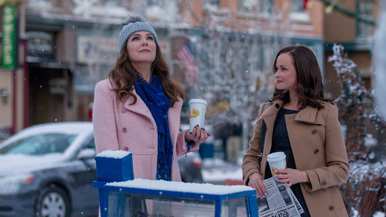 Winter makes for an uneven but delightful first chapter of the Gilmore Girls return. Although it wasn't a smashing success when it debuted on October 5, 2000, Gilmore Girls had a large, lasting cultural impact that its solid but unspectacular ratings didn't accurately convey. The show's original run lasted seven seasons, debuting on the now defunct WB and then moving to the CW in 2006. Created by Amy Sherman-Palladino, the show focused on the lives and relationships of a mother and daughter who were more like best friends. Palladino originally got inspiration for the show's setting, the fictional Stars Hollow, Connecticut, after making a trip to Washington Depot, Connecticut. The small-town charm had a big impact on Palladino and is a significant part of what made Gilmore Girls so special. The titular Gilmore girls are made up of Lorelai, (Lauren Graham) who left her parents' home at the age of 16 when she got pregnant. The daughter is also named Lorelai but goes by Rory. (Alexis Bledel) She makes up the second part of the Gilmore equation. Lorelai's family wants her to marry the father but she instead decides to move out and raise her daughter on her own. Fortunately, she and Rory are taken in by Mia, the owner of the (aptly titled) Independence Inn. There, Lorelai worked her way up from a maid to executive manager.